“Brexit means Brexit”. For Theresa May, soft Brexit does not exist: an exit from the European Union necessarily means an exit from the European single market. Brexit therefore means hard Brexit for the British government. 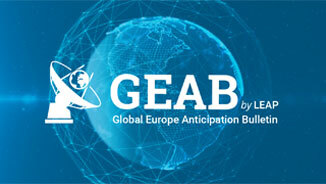 Within our GEAB bulletin no 103, we have already stated the possibility that the City might find itself “on the outskirts of the European continent” by 2020. Along with the negotiation terms, comes the first move induced by the difficult, but inevitable, divorce. And as in any divorce case, the two partners have to share the house furniture. In case of Brexit, the financial companies move their headquarters, assets and jobs to the continent. On the European side, Michel Barnier, the European Chief Negotiator for the UK’s exiting, said that “there could be no special agreement for the City”. Since no other trade agreement with a third country currently covers financial services, the European Commission plans to avoid at any cost a possible à la carte agreement for the UK for fear of a domino effect. Indeed, for Brussels this would endanger the very functioning of the Union by attracting the wrath of countries complying with European directives. Now more than ever, our team’s anticipations are valid. To set up the independence of the Eurozone, the Europeans seem ready to free themselves from London, even if this means they will leave some feathers behind. Brexit or no Brexit, London will see its access to the single market restricted and the United Kingdom will be perceived as an unstable continent for investors. 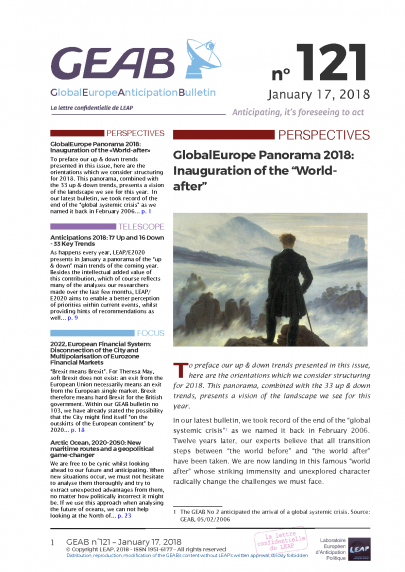 Currently we anticipate a gradual disconnection between the City and the single market during and after the post-Brexit transition period, as well as a multipolarisation of the financial services in the Eurozone by 2022.